Airborne & Impact Noise. Floorboards will be lifted to expose floor joists. Mineral wool is friction fitted between joists and floorboards fixed back in place. All gaps between floorboards are sealed with acoustic sealant. 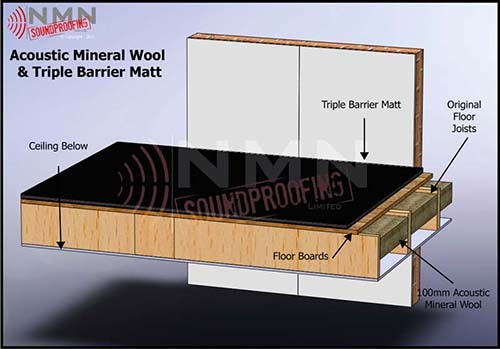 Sheets of 15mm Triple Barrier Mats are fitted on top of floorboards. Perimeter strips are recommended when fitting a hard floor covering to minimize flanking noise traveling down the walls.